Kai Altair is a classically-trained singer-songwriter who has spent time performing with and belonging to several groups who have helped to shape Altair’s writing style. In addition to those years spent with other people, other elements also helped to shape Altair’s way of composing music. Elements like dance culture, myth, storytelling and dreams all add to the way Altair’s music sounds. The resulting music from Kai Altair is equal parts New Age and Folk music with just a little bit of Electronica thrown in. Altair’s music can be compared to groups like Secret Garden who also create New Age music with a dreamlike quality to their songs. 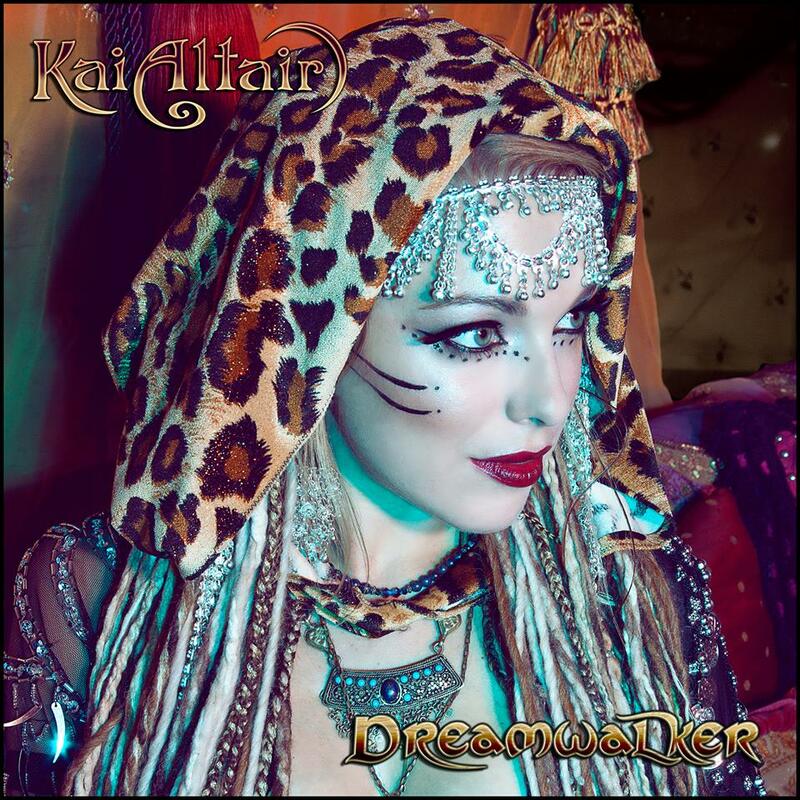 Kai Altair is currently celebrating the release of her first full-length release entitled Dreamwalker. The songs included on the release feature words and music from Altair and features production from Dave Sharma & Dhruva Ganesan that brings Altair’s music to life.The new album from Kai Altair begins with the track “Draw Down the Moon”. The track begins with a slow pace with a spiritual feeling that surrounds the listener’s senses. The gentle feeling of the song soon builds to include some electronic elements that help add a strong, yet easy beat to the song. The vocals from Altair on the track will remind people of someone like Sarah McLachlan. The gentle feel of that delivery goes well with the visual feeling of the track. Dreamwalker continues with the track “Shadow Dance”. The track takes the feeling of the first track and adds a lot more power to it. The track still features an underlying New Age spirit to the lyrics of the track but finds Altair adding a dance beat to the song. The energetic feel of the song helps to separate the two tracks from each other. The track “Change” is one of the most infectious of the tracks on the Dreamwalker release from Kai Altair. The gentle feeling of the song, mixed with the electronic sounds from the keyboards, creates a track that features a New Age-meets-Folk feel. The addition of the effects in the background of the track adds a lot of body to the track, as well. “Change” could easily be one of the strongest tracks on the album. With the track “Ancient Future,” Kai Altair creates another track that combines several different elements together which end up making a song that is as much about the fun feel of the music as it is about the lyrics. The dance element of the track’s music is combined with a strong cosmically spiritual feeling. The track’s lyrics about how time changes a person mix well with an easy dance beat that seem to transport the listener to some strange time period that is yet to come. “Ancient Future” is probably the track with the deepest meaning in its lyrics. At the opposite extreme is the track “Inside a Dream”. The song features a minimal amount of lyrics as the track is more about the visuals created by the slightly psychedelic music. When listening to the track, the listener could easily get caught up in a dreamstate because of the music. With the track of “She Holds Me,” Kai Altair adds a slightly Celtic feel to her release. The reason for the Celtic feeling is because of the inclusion of the musician named HÄANA, a musician who plays the fiddle and takes the same approach to life as Kai Altair. The Celtic feeling added to the New Age-meets- Folk feel from Altair creates a track that brings to mind the music of the New Age band Secret Garden. Kai Altair’s music feels very relaxing and the listener will be drawn in as soon as they put the Dreamwalker album from Altair on. While this is the type of release that could be played as background music, the songs contained within the release are strong enough to keep the listener’s attention from the first track until the last note. Put on a pair of headphones and find yourself becoming one with the music of Kai Altair. To check out Kai Altair’s video “Change,” click on the link. Existing somewhere between Dance music and R&B, the musician known simply as The ConSoulTant is currently creating music that will have you running onto the dance floor and having fun. The ConSoulTant (who is also known as Selita) is an Atlanta-based artist who is in the middle of creating her first release. In the meantime, she has released her first single of “New Year, New You”. Released just in time for 2013 to turn into 2014, “New Year, New You” by The ConSoulTant is a very appropriate song for the time of year. The track features upbeat lyrics that go along with the idea of starting fresh with a new year. While the song does seem to lack variety in the lyrics as they are repeated throughout the track, the beat makes up for that as the track features a very strong bass line with enough bounce to the beat to have the listener craving more. The one thing that would be a disappointing aspect of the track “New Year, New You” by The ConSoulTant is the fact that it comes in at under 3 minutes. But that might be a good thing, as it guarantees that the listener will not get tired of the song. Another drawback is that with the song having the type of subject matter that it does, the track seems to have a short shelf life as the track will be pushed to the side once the second month of the New Year is upon us. But with that being said, “New Year, New You” by The ConSoulTant is a strong track and should be enjoyed now while the time is right. And besides, there is more to come from this up-and-coming artist, so enjoy the energy of this track now and stay tuned to hear what comes next.